In a past blog I mentioned my cousin who still lives on one of the family homesteads in Idaho. Being the family’s unofficial family historian, she is by default the recipient of many of the family keepsakes. Old photo’s, letters and passed down recipes make up just part of this treasure. She was the one who provided, among others I will someday post, the recipe I posted on my grandmothers homemade bread. Knowing my love of cooking and wishing to help me in my sharing of heritage recipes, she took the time to email me each recipe she thought I would like. 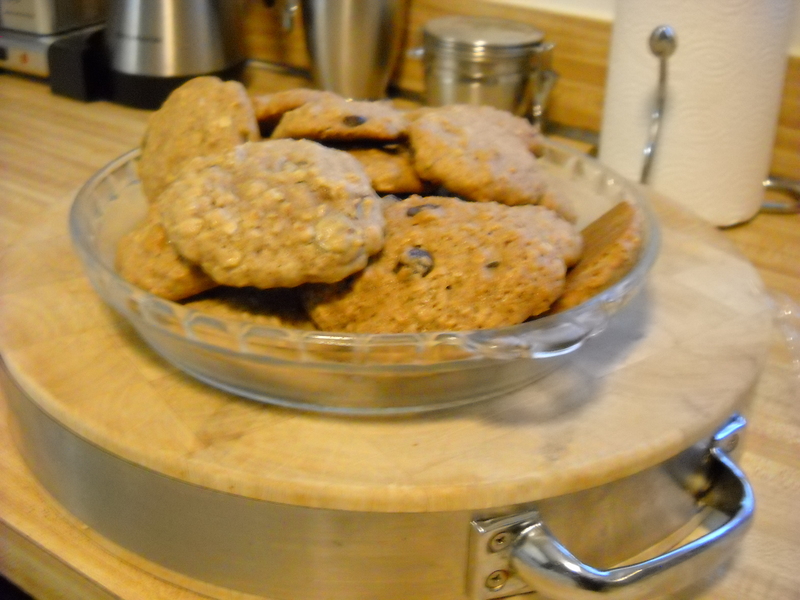 One of them was my Grandmothers recipe for oatmeal cookies. It was given to her by her counterpart, my Ohio Grandmother, on my Moms side of the family during a visit to Idaho in 1947. I figure this recipe is probably from the turn of the century since my Ohio Grandparents house was built in 1917. 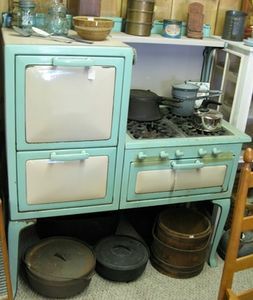 It makes sense that the house would have been outfitted with a new gas stove as gas for lighting and cooking was available to them back then and the brand of stove was popular. I have no idea how much ‘table sugar’ or ‘broken chocolate pieces’ she left out but I think I would agree with my grandfather Hamblin that these cookies are sweet enough without the added sugar. If you differ, add a ¼ cup and see what they taste like. I do add ¾ cup of Ghirardelli dark chocolate morsels though. I suggest you adjust it from there and the worms be damned! I was really surprised to see that no butter was used in her recipe. Instead it calls for oil (remember, the recipe originated in Cleveland Ohio). During WWl, butter and cream became scarce and expensive in the cities and this was probably reflected in the baking recipes of the day. Milk was still available. Conversely, in the rural countryside, many people still owned a dairy cow and made their own butter, cream and milk and were not as affected as their city living counterparts. I suspect the oil used in the recipe was the popular cotton seed or recently invented corn oil. All this may explain the absence of butter in the recipe since the cookbook was included with the purchase of a Cleveland Ohio stove manufacturer’s product. (American Stove Company, now called Magic Chef). 1/4 Cup of granulated cane Sugar to taste (optional) I would suggest starting with 1/4 of a cup and go from there. Let stand for 10 minutes. Drop a heaped tablespoon of cookie mix onto greased baking sheets. Bake at 350° for 12 minutes or until lightly browned. Remove immediately to cool. It started out as 3 dozen but by the time I took this photo (20 minutes later) I was left with only about half of them!